Andrew McCarthy and Jami Gertz spend their time looking for Robert Downey Jr. who’s whacked out on drugs and prostituting himself. They find him. They lose him. They find him. They lose him. They find him. He dies. The End. If LESS THAN ZERO is trying to squeeze pity out of us for the poor, derailed yuppie turned junkie, they won’t find it here. I’ve dealt with enough people who are supposedly “nice,” “good-hearted,” “intelligent,” “talented,” and blah blah, who cancel out every iota of goodwill or talent they supposedly possess by letting hard drugs or hard drinking ruin their lives and make unbearable the lives of those around them and those trying to help them. They promise (they’ll give up, they’ll be there, they’ll only be a minute), they steal (your time, money, DVD player), they vomit (on themselves, on you, in your car), they embarrass you (with friends, strangers, other junkies), not to mention all the grand moneymaking schemes and personality-disorder mood swings – goddammit! You wastes of human life! Just get away from me! McCarthy is Clay, who returns to the Los Angeles preppy scene from some fancy-pants college at the request of his ex-girl Blair (Gertz), to help their bestest friend Julian (Downey), who has gotten himself into another fine mess with pimpy Rip (James Spader, as always, playing despicable with a flair that comes way too naturally). Julian is skagging until flames are comin’ out de side, owing 50-large to Rip, who sets him hooking to pay back the wad. 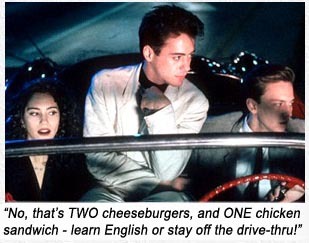 Needless to say, Robert Downey Jr. fulfills all the above junkie criteria in LESS THAN ZERO. Movie is held together solely by his rabid dog performance. McCarthy has never been able to act his way out of a paper bag and Gertz has the misfortune of once being a showroom dummy magically brought to life but not imbued with a soul. Spader is so evil he’s just funny. My antipathy towards junkies runs even deeper when their parents are swimming in dough. It means they had all the breaks and they still ended up less than zero. I don’t know whether it’s because I’m too cool to try to be cool or that I’m missing the boat on what it takes to actually be cool, but I’m pretty sure the preppies and yuppies and WASP-ies in LESS THAN ZERO are trying way too hard to Be Cool and failing miserably at it. LESS THAN ZERO captures too well author Bret Easton Ellis‘s infamous nihilism. That’s quite a task, as this formulaic, manipulative movie departs from the Ellis novel considerably. Technically, these misguided drogues are not really nihilists – that’s too much of a stretch for their pedestrian imaginations – they’re really pleasurists; short-term pleasure-seekers with no cerebral motivation past the present moment. In an era when Gordon Gekko told us “Greed is Good,” this movie runneth over with social climbers all climbing in the wrong direction, overprivileged yuppie scum suffused with that spark of nothingness masquerading as somethingness. — Dr. Robert Lustig, MD, UCSF. Doesn’t that say everything about the pastel tonality and over-ripe mentality of LESS THAN ZERO? Writer: Bret Easton Ellis, Harley Peyton. Starring: Robert Downey Jr., Andrew McCarthy, Jamie Gertz, James Spader, Tony Bill, Nicholas Pryor, Donna Mitchell, Michael Bowen, Sarah Buxton, Lisanne Falk, Michael Greene, Neith Hunter.